Reuters News Service published the following story today “Japan activates first marines since WW2 to bolster defenses against China” and free nations around the world should collectively applaud Japan’s effort to reinvigorate its military nearly seventy-three years after the end of World War II, which also marked the beginning of Japan’s pacifism. There is only one problem with pacifism, SOMEONE has to guarantee your ability to be a pacifist or soon you will we dead or a captive of another nation or organization that has imposed its will on your peace loving group. 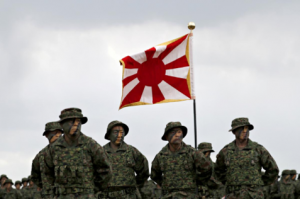 With this “activation” Japan has chosen to take a greater role in its own defense which is long overdue. BRAVO! The situation the free nations of the world find themselves in this spring of 2018 is is a familiar one: CONFRONTING DICTATORS. History teaches a very consistent lesson over thousands of years, that peace can only be achieved and sustained through strength. Is there anything that China can do in the face of an alliance composed of Australia, Vietnam, the Philippines, Taiwan, Japan, South Korea and the United States? The short answer to that is “no,” that alliance is simply too strong. The reason we should celebrate Japan’s activation of their first marines since WW2 is because it is the clear path that all free nations must follow in order to remain free and to promote free trade and free economic growth. One only has to look at China’s “Belt & Road” initiative to see the what China has planned for the Pacific, Asia and Africa. As the Commandant of the Marine Corps,,General Robert Neller, stated in hearings before the House Appropriation Committee on March 7, 2018 “China is seeking to win without firing a shot. ” China has weaponized its economy and uses it coersively to move free nations to support of its expansionist policies around the world. From unilaterally rejecting the unanimous ruling of the International Court of the Hague in 2016 case brought by the Philippines regarding China’s “Nine Dash Line” in the South China Sea to most recently telling Vietnam (for the second time) that it has no right to develop oil and gas leases Vietnam’s “Economic Exclusion Zone” — China is playing the bully to free nation. In the face of this, Japan has pushed back. Again BRAVO! Japan understands that it is only a question of time before China attempt to replay the strategy used in the South China Sea in the East China Sea over long contested islands and fishing rights. Japan also understands that it cannot solely depend on a United States Foreign Policy that failed to confront China over events in the South China Sea with the valuable Japanese assets located in the East China Sea. Again BRAVO! The next free nation that needs to embrace its role in global stabilization is Germany. A weak German military emboldens Vladimir Putin’s Russia and promotes instability in Europe. Here’s hoping that well thought Germans are watching the Japanese and will soon fully fund their NATO commitment as well as reinvigorate their military. Europe is no different from the Pacific, the future of peace and the march of free peoples demands that free nations operate from a position of strength to guarantee that peace.